The epic tradition has been part of many different cultures throughout human history. This noteworthy collection of essays provides a comparative reassessment of epic and its role in the ancient, medieval, and modern worlds, as it explores the variety of contemporary approaches to the epic genre. 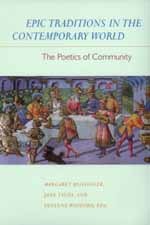 Employing theoretical perspectives drawn from anthropology, literary studies, and gender studies, the authors examine familiar and less well known oral and literary traditions—ancient Greek and Latin, Arabic, South Slavic, Indian, Native American, Italian, English, and Caribbean—demonstrating the continuing vitality of the epic tradition. Juxtaposing work on the traditional canon of western epics with scholarship on contemporary epics from various parts of the world, these essays cross the divide between oral and literary forms that has long marked the approach to the genre. With its focus on the links among narrative, politics, and performance, the collection creates a new dialogue illustrating the sociopolitical significance of the epic tradition. Taken together, the essays raise compelling new issues for the study of epic, as they examine concerns such as national identity, gender, pedagogy, and the creation of the canon. Margaret Beissinger is Lecturer in Slavic Languages; Jane Tylus is Associate Professor of Comparative Literature; and Susanne Wofford is Associate Professor of English. All are affiliated with the University of Wisconsin, Madison.